Building on strong economic and finance principles, this text for both salesperson and broker candidates explores how real estate fits into the economy and economic vitality. 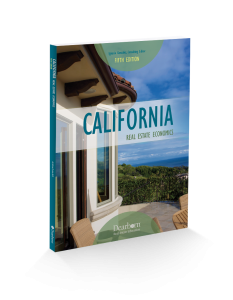 “In California” section and state appendices relate the discussion to local issues. A complete set of instructor materials includes outlines, a PowerPoint presentation, and two final exams with answer keys to help instructors prepare for class.